Weather forecasting – # 1 Where to look? There’s a lot to weather, and weather influences our daily lives enormously. Whether that’s by deciding to walk or drive to school, hang out the washing or not, go for a surf or a flat water paddle? By knowing what the weather’s doing right now, later today, tomorrow and even next week, helps us plan what’s best to do in the day. But for us paddleboarders being able to predict and understand the weather is vital to ensure a successful SUP session. Predicting the weather correctly can help us decide when and where best to go paddling, what kit to use and even what SUP discipline to choose. Weather forecasting is improving all the time although you might not think it sometimes! And luckily for us paddleboarders there are now numerous resources available to collect information about the weather and help us plan our next session to perfection. But where can we find reliable weather forecasting information? How can we understand it? And how can we use it to help work out when best to go paddleboarding? In this 2 part series we’ll be looking at just that. Finding out about weather forecasting and websites, and how best to use them to predict our perfect paddle session or make the most out of a bad day. Today, in the UK and around the world there are many online weather forecasting sites, so really it all comes down to personal preference. Which ones do you find clearer? Which ones do you find more accurate and include the info you want? And which ones are most local and relevant to you? Examples of weather forecasting websites include Windguru, Swell Maps, A1 Surf, BBC Weather, XC Weather, Magic Seaweed, Big salty and Surf-Forecast. The SUPboarder team personally like to use a combination of three, Windguru, Magic Seaweed (MSW) and a local weather station to assist with their weather predicting. MSW also provides tide times as well as more detailed swell predictions (primary and secondary) as swell and surf forecasting is their main interest. You may think, why is that important because it’s already happening?!! But this site is probably one of the most important ones, as I’ll explain later. You may well have your favourite forecasting site, but there are many benefits of using more than one, such as more info, more accurate predictions and a better understanding of how the weather is working/moving. We like to use a combination of all the above weather stations when predicting weather, to ensure we get the most accurate prediction possible. 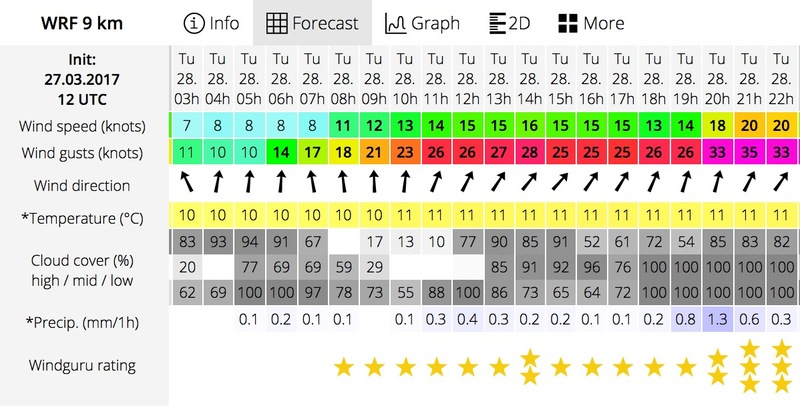 Over the years we personally find that windguru is very accurate when it comes to wind, rain and cloud cover, and MSW is particularly good for swell and wind predictions, as well as providing high/low tide times. Looking at a combination of forecasts and cross referencing them off each other is the real art to weather forecasting. Knowing exactly what’s going on at your local weather station, helps to confirm the weather forecasting site predictions. e.g has the wind changed direction like it was forecast to? Has the wind strength picked up early? Does it look like the weather system has moved through early, meaning tomorrows forecast might change slightly by the morning? If the local weather station is positioned at your local beach or paddle spot then that’s ideal, as you’ll know exactly whats going on! Local Weather Station. All three of the website screen shots were taken at the same time 13:25pm. And you can see for example that the wind direction on this screen shot showing the real local weather is saying that it hasn’t swung to a South Westerly direction yet, like it said it would be on Windguru and MSW. But the wind speed they predicted is spot on. 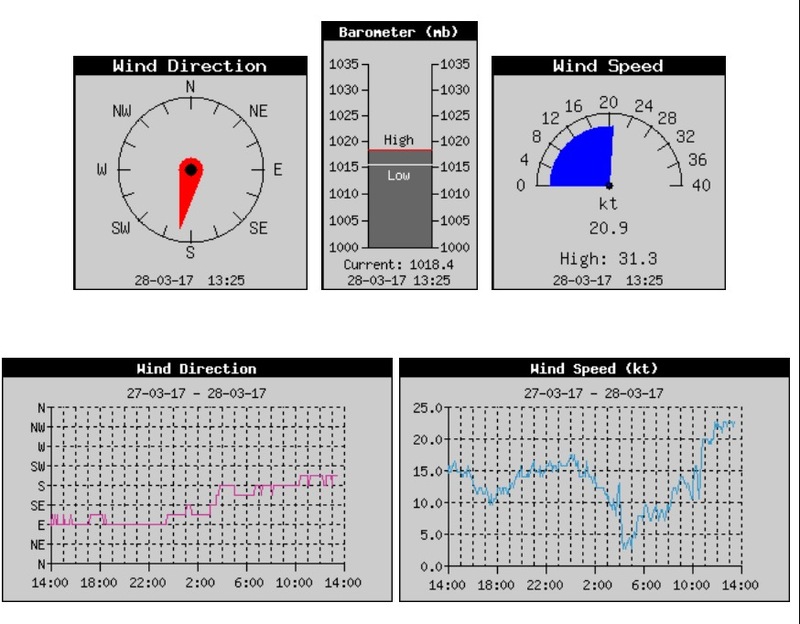 (remember Local Weather and Windguru are showing Knots as wind speed and MSW is using MPH which is higher). We find that these forecasting sites work well for us and our local area and they might work well for you too. But to find out which forecasting sites are most accurate in your area, takes time. Look at the different forecasts available, be aware of the daily weather and compare the forecasting to the local real weather station and what you see out the window or at the beach! You’ll soon find out which forecasting sites know what they’re talking about and which ones are worth looking at! Beach web cams are also another valuable source of collecting weather information. 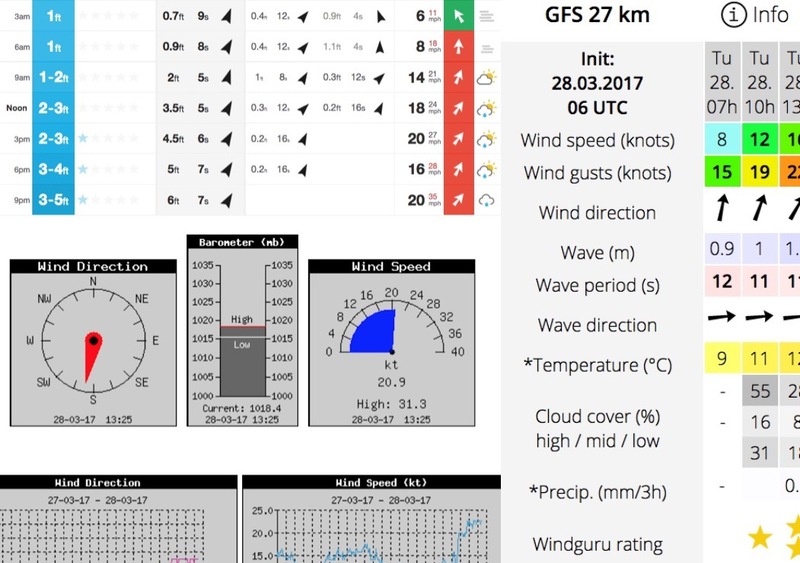 Obviously they again are showing the current weather and at the beach can provide essential info re; swell size, period, conditions (e.g. glassy or choppy) as well as how busy it is! By starting to follow forecasting websites like Windguru and MSW you will find it the easiest way to start understanding weather, especially if just the look of all those lines on a synoptic weather chart makes you feel sick or want to run a mile! Understanding weather predictions and the current weather is not only interesting it can be unbelievably useful. For example… to help ensure that the frantic drive to the beach after work is worth the effort, you don’t get caught with an evil headwind at the end of a long days paddling, and there are waves where you expect there to be waves! 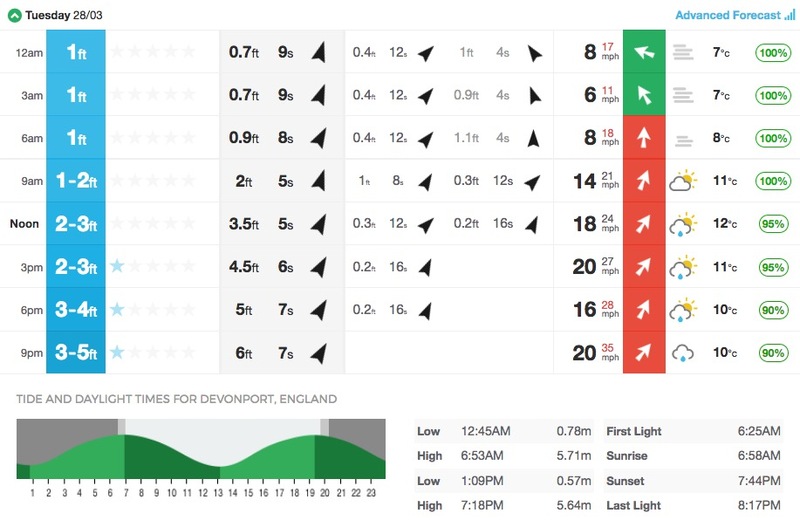 Direction arrows point is to where the wind/swell is going. Remember some forecasts use miles per hour (MPH,) and others kilometres per hour (KPH), but ones more aimed at wind will always use Knots. Wave period means the time between waves. Bigger period the better. 5 secs is bad and 12 is good. Don’t be tempted to use just one website even though it maybe right most of the time. You’ll get a much more accurate and detailed prediction by looking at a few. Most weather sites will be better at certain parts of forecasting. A good place to find a good current weather station is at your local airport. Set up a bookmark on the computer and save a few weather sites on it. In the second part of this series we’ll be looking at how to interpret weather forecasting info to make the most out of your SUP session. So, this year, to enjoy your paddleboarding more and to help you get the most out of each session, think more about the weather, and try and understanding your local weather better. You’ll be glad you did!